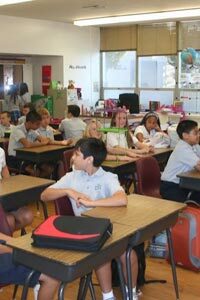 Saint Francis de Sales School provides a challenging, comprehensive and relevant curriculum for each student that fulfills the school's philosophy and mission. Instructional Overview and Content standards are derived from: California Department of Education (http://www.cde.ca.gov) and Archdiocese of Los Angeles, Department of Catholic Schools (http://www.archdiocese.la/learning/schools/curricula). Our professional staff designs and implements a variety of learning and formational experiences which actively engage students. Assessment results are the basis for measurement of progress for regular evaluation. There are two teachers in every classroom.